Coming soon, TriMet will launch the first of several major track improvement projects at key areas along the oldest section of the MAX light rail system. The 1st Ave MAX improvements project will start Sunday, May 8 and run through Saturday, May 21. MAX service must be adjusted during the work and riders are encouraged to plan extra time, alter their trips if possible, use TriMet’s regular bus service or consider other transportation options during the two-week project. 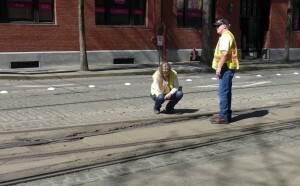 TriMet Maintenance of Way staff examine the switch at NW 1st and Couch. The original MAX alignment opened Sept. 5, 1986 and stretched from Cleveland Ave Station in Gresham to SW 11th Avenue in Portland City Center. After serving riders for 30 years, it’s showing its age. In the coming years, we will be tackling important projects along that original stretch that will increase MAX reliability, lessen delays and create a smoother, better ride. We’ll be replacing some problematic switches, installing new rail and overhead wire in sections and upgrading trackway materials with newer, longer-lasting products. This year the projects will be along 1st Avenue in Portland City Center and in the Rose Quarter area. TriMet staff will work diligently to maximize the work done and minimize, as much as possible, the inconvenience to riders but all these projects will require MAX disruptions and reduced frequency. From start of service on May 8 through end of service on May 21, TriMet will make major improvements along 1st Avenue in Portland City Center. We are combining three projects into one to be more efficient and lessen the impact to riders and the public. 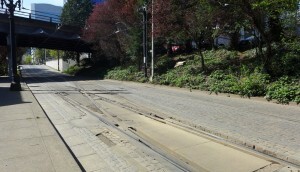 Crews will replace a section of curved rail near Skidmore Fountain and two switch sections – under the Morrison Bridge and at NW 1st and Couch. The trackway under the rails will be improved as wooden ties and other elements will be replaced with more durable materials. Drainage will also be improved under the Morrison Bridge. The work, estimated at $2.1 million, will make for a smoother, quieter MAX ride and help us to keep trains running on time. It also will benefit pedestrians, cyclists and motorists – especially in the area of NW 1st and Couch as broken pavement, cobblestones and bricks will be fixed. We ask for riders’ patience, as well as the public’s, as the work requires closing 1st Avenue between SW Morrison and NW Davis, and shutting down the MAX alignment on 1st Avenue. Most cross streets will remain open to traffic but NW Couch Street between Naito Parkway and 2nd Avenue will be closed. Blue and Red Line trains will be detoured off 1st Avenue in Portland City Center, and run on the Transit Mall along 5th and 6th avenues. Shuttle buses will run on 2nd and 3rd avenues, serving temporary stops near closed MAX stations on 1st Avenue. On the westside, only Blue Line trains will run between Hillsboro and Library/Galleria MAX stations. Green Line trains will run only between Rose Quarter Transit Center and Clackamas Town Center. Orange and Yellow lines will run their regular routes. All MAX lines will run on reduced frequency, or about every 20 minutes, except for the Blue Line section between Hillsboro and Portland City Center. As the Blue Line is the only MAX line that will be running in that section, trains will run about every 10 minutes during commute hours and every 15 minutes during other times. Due to the reduced frequency, trains will be crowded especially during main commuting hours. Consider altering trips to avoid rush hours, working from home if possible, taking regular bus service or using other transportation options during the project. Room for bikes on board MAX will be very limited due to the crowds. To prevent extended delays, either cycle your entire way, park your bike at a station, or leave your bike at home during these two weeks. Riders should allow at least an extra 15-30 minutes to their trips. Get line-by-line details at trimet.org/firstavenue. TransitTracker and TriMet’s online Trip Planner on trimet.org will reflect the service adjustments during the improvement project. TriMet staff will be conducting on-board, on-street and electronic outreach in the weeks ahead of the project to inform riders about the service impacts. We also will have staff at key stations during the project to help riders get where they need to go. During the 1st Avenue MAX improvements, other TriMet crews will take advantage of the service disruption to upgrade a substation that feeds power to the overhead wire and replace some equipment on the wire. Crews also will clean some drains in the closed section. We want to thank riders in advance for their patience, understanding and help during the project. We know the temporary service adjustments will affect our riders’ trips and schedules but the work we do now is necessary to improve the MAX system for the decades to come.